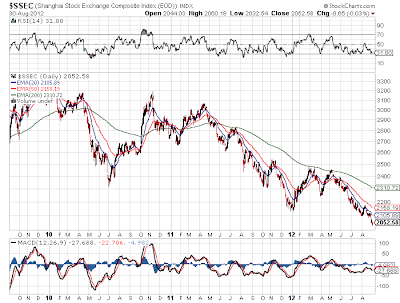 Amazingly the China stock market as represented by the Shanghai Composite keeps to new multi-year lows. As seen from the below 3 year chart, the index as virtually fallen every month since the peak back in October 2011 at nearly 3,200. 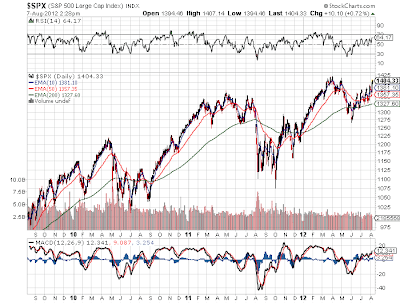 The index is now barely holding onto 2,000 after a very weak summer. Ultimately this should lead to more stimulus eventually. Investors should keep an eye on a bottom for the coal producers or other mining stocks that have been crushed this year. China has clearly slowed down, but the question still remains whether growth will be 6% or 8% which is a far cry from a recession. On Monday, Seadrill (SDRL) highlighted on the Q2 earnings call that deepwater drilling remains a very hot sector with limited available rigs for the next couple of years. This was a theme highlighted at the beginning of the year as drilling in the Gulf of Mexico had picked back up. The company provides offshore drilling services to the oil and gas industry worldwide. Its services include drilling, completion, and maintenance of offshore wells; production drilling and well maintenance; and well services. The company owns a fleet of offshore rigs and has 18 new builds under construction. While the adjusted earnings slightly missed estimates, Seadrill continues to see huge demand for its rigs and tightness in the market for the next few years. The company has one of the youngest fleets in the industry and continues to benefit from an aggressive new build program. Back on August 2nd, Zipcar (ZIP) reported disappointing Q2 results and guided down for 2012 sending the stock down over 30% that day. Looking at the chart, the stock has absolutely collapsed since going public at $30 in April of 2011. Is Zipcar really this bad a company? According to the company, it is the world's leading car-sharing network, with more than 730,000 members and 11,000 vehicles located in major metropolitan areas and college campuses throughout the United States, Canada, the United Kingdom, Spain, and Austria. The company has had an absolutely miserable time in the public markets. Though seen as an innovative market leader, it has yet to have a positive run in the stock market. In fact, the stock has been on a steady down slope throughout the whole 16 months as a public company. In fact, the 50ema has rarely been breached while the 200ema has never been approached. Both are signs technicians use to identify a very bearish stock. After the market closed on Wednesday, Kayak Software (KYAK) reported Q2 2012 earnings that slightly beat estimated results. Importantly this was the first earnings report since going public back on July 20. See article here. The company proclaims itself as the best place to plan and book travel. The basic focus of the company is to enable people to easily research and compare accurate and relevant information from hundreds of other travel websites in one comprehensive, fast and intuitive display. While revenue easily beat estimates, the adjusted earnings came in at $0.25 versus the $0.24 analyst estimate. The company only provided the GAAP earnings of $0.19 possibly providing for the stock sliding after hours. Sprint (S) continues with an aggressive plan of unlimited data pricing while wireless leaders AT&T (T) and Verizon (VZ) move towards capped data plans. Back in May, Sprint aggresively promoted an unlimited plan for the iPhone 4s to directly attack fed-up Verizon customers. The company offers a comprehensive range of wireless and wireline communications services serving more than 56M customers. It offers mobile data services under both the Sprint and Nextel brands plus prepaid brands including Virgin Mobile USA, Boost Mobile, and Assurance Wireless. The telecom sector has been ripe with pricing pressure for decades now. The question remains whether this move is good for Sprint or incredibly naive for the market leaders. The CEO of Peabody Energy (BTU) is famous for proclaiming the Super Cycle in coal. A funny thing happened on the way to realizing this proclamation. The company produces and sells thermal and metallurgical coal to customers in more than 25 countries on six continents. Market data still shows healthy demand for coal in Asian countries that continue to build coal-fired power plants. Unfortunately for coal producers, a chain of events from slowing growth in China to the advances in production of natural gas in the U.S. has slowed down the short-term demand for coal. The debate continues to rage, usually to the extremes, of whether Sears Holdings (SHLD) has no value or enormous value due to a vast array of undervalued assets. For example, the owned real estate is mostly valued at cost and not current market values leaving a wide debate on the proper valuations. See my past articles on these subjects here. The company operates as a specialty retailer in the U.S. and Canada. It operates under the Kmart and Sears segments with major brands such as Kenmore, Craftsman, DieHard, Joe Boxer, Lands End, and Jaclyn Smith. This will be the first part of a series intended at discussing the recent Q2 earnings announcement, followed by the Bruce Berkowitz case study, and finally a review of the pending spin offs. Disclosure: Long SHLD, GPS, and KSS. Please review the disclaimer page fore more details. Like so many other social media and technology related IPOs from 2011 and early 2012, Jive Software (JIVE) quickly became very overpriced as the stock soared to $28. The market had huge expectations that far outweighed anything the company could produce. Even beating or meeting all three earnings reports since going public haven't been enough to keep the stock price at those highs. The company is a leading global social business software company. Recently, the stock sold off 22% after reporting Q2 numbers that were mostly in line, while revenue guidance was at the low end of expectations. A stock trading at nearly 10x revenue has to increase guidance in order to sustain that valuation. If the news from the WSJ late Sunday night is accurate, Aetna (AET) offers an extremely cheap stock. The company is rumored to have finalized a deal to acquire Coventry Health Care (CVH) in a $5.7B deal. Both companies are leading national managed health care companies. Coventry has a larger focus on government-based health plans that apparently attracted the interests of Aetna. Considering Aetna has only a $12.7B market cap, this is a sizable deal for the company to undertake, though the company could quickly show how beneficial a mostly cash deal can be in this ultra low interest rate environment. fter reporting earnings on Tuesday morning, Velti (VELT) jumped nearly 12% after beating analyst revenue estimates. Combined with a big gain on Monday, the stock had a nearly 20% two day gain. Amazingly though, it still trades at extremely low valuations. The company engages in the provision of mobile marketing and advertising technology and solutions for brands, advertising agencies, mobile operators, and media companies around the world. Disclosure: Long VELT, CJES, and SODA. Please review the disclaimer page for more details. This model lost a disappointing 6.6% in July versus a 1.3% gain for the benchmark S&P 500. This model typical outpaces the major indices by a large margin in up periods so the last month was a major exception. Since the end of 2011, this model has been running on the theme that the majority of stocks would retrace the losses experienced since the July 2011 levels. In essence, our theory all along has been any losses since that time period were from irrational fear of a second financial collapse that the Europeans were unlikely to allow. Naturally this fluctuates on a case by case basis where any individual stock could move a lot higher or lower depending on circumstances since then. Unfortunately this theory took a major hit as investors piled into dividend paying stocks sending most major indices back close to 2012 highs while at the same time selling the higher risk, global growth stocks. In some cases, stocks actually hit new 52 week lows recently. This blog has pointed out similar concerns with the balance sheets and dividend payouts of AT&T and Verizon (VZ) numerous times. These companies should be paying down debt instead of paying out cash to shareholders. Anybody following the stock or the solid-state drives (SSDs) industry has probably seen the drama with OCZ Technology (OCZ) over the last few weeks. Several influential journalists reported that a deal was done with Seagate Technology (STX) for over $1B, valuing the stock at close to $15. Unfortunately weeks have passed without a deal announcement and the stock that shot up to over $8 in after market trading on July 27th now trades under $5. On top of that news, the CFO announced his retirement last week adding more fuel to the speculation fire. Not to mention the annual shareholders meeting took place on Monday eliciting investor hopes of noteworthy news. At times like this, investors need to understand what they own with a clear defined plan for exciting the position. A smart investor either took advantage of the price spike or is now loading up shares as the rumors fade. Dsiclosure: Long OCZ. Please review the disclaimer page for more details. After reporting earnings on Wednesday night, Continental Resources (CLR) moved up slightly as investors battled over the huge production gains and the spending increases. For some reason the market was disappointed with a forecast increase in capital spending while oil approaches $94 (not to mention that Brent crude exceeds $112). The company is an oil and natural gas exploration and production company focused on the Bakken and Anadarko areas. The market remains very focused on reduced spending in the domestic energy production sector that any added spending is seen as negative. SandRidge Energy (SD) encountered this very problem the previous week. Though natural gas still struggles around $3, the market is missing that oil prices remain strong. Why wouldn't an oil exploration company attempt to produce more oil at these prices? This article is a continuation of a series highlighting the top net payout yield stocks that was started in June (see article) and repeated in July (see article). The series is meant to highlight the best stocks for the upcoming month so this report is clearly late. Though with the majority of the month left, it is still worth reviewing last month's results and the updated list as of data from August 10th. This model was down 0.5% in July versus a 1.3% gain for the benchmark S&P 500. Oddly the model has fluctuated a lot in recent months with large cap stocks in the model moving up or down 10% on earnings reports. While typical of smaller companies this usually doesn’t happen in companies with market caps exceeding $10B. Trades As mentioned previously, one goal of this model is to slowly trim the amount of positions back closer to 20 after reaching 26 due to mergers and partial positions. Hence, the model sold the remaining holdings in Home Depot (HD) and added to existing small positions in Hartford Financial (HIG) and WellPoint (WLP). Home Depot was unloaded as the stock finished a long run from October last year where the stock went from just over $30 to the selling price over $51. This considerable gain pushed the Net Payout Yield (NPY) down as the company dropped buybacks. Not to mention that competitor Lowes (LOW) remains a Top 5 holding. Prior to the open on Wednesday, SodaStream (SODA) posted earnings that handily beat analyst estimates and initially sent the stock soaring nearly 10% in pre market trading. Revenues soared 49% year-over-year and net income soared 43% from last year. The company is a leading manufacturer of home beverage carbonation systems. Even though the company also raised guidance, the stock ended the trading day in negative territory. Below are some of the stats provided by Covestor on our Net Payout Yields model. The performance of the model is 4.3% or 430 basis points above the S&P 500 over the last 21 months. 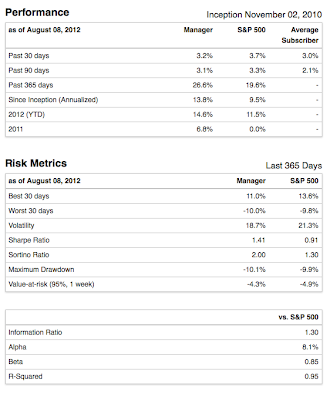 Also note all of the risk metrics that are so crucial for investors to review. With the Beta below 1.0, this model is achieving a higher return while taking less risk. The below chart shows the model's performance since January 1st, 2011. This removes the startup hiccups especially as the model quickly underperformed by 2% when it wasn't fully invested mainly caused by a timing issue. Potential investors can easily review the full data at Covestor, but you need to understand that the startup situation will not repeat with anybody investing directly via Stone Fox Capital or Covestor. Any funds directed towards this model will immediately be invested at the prevailing stock prices. Please contact Covestor or us at info@stonefoxcapital.com for more information on investing. After repeatedly hearing so many issues with monetizing mobile traffic from the likes of Facebook (FB), Millennial Media (MM) continues to report massive growth. The company reported 75% revenue growth in Q2 2012. This number bodes well for Velti (VELT) owned in our models. The CEO of MM went on CNBC this morning. Its worth a watch for anybody interested in the sector. One of the most important take aways from this industry is that companies moving from a reliance on desktop supported ads for revenue to mobile is having a hard time matching those numbers. In cases such as Facebook, the company wasn't even ready for the transition to mobile by customers. Another important distinction is that a major difference exists between a retailer advertising on mobile versus Facebook attempting to place ads on mobile devices. The 3D printing market continues to remain hot as top competitors 3D Systems (DDD) and Stratasys (SSYS) again surged to new all time highs last week. The sector has been hot amid advancing capabilities of additive manufacturing via localized 3D printing even now affordable at home. On top of that, Stratasys reported results last week that helped boost the stock and the sector even more. Stratasys is a leading manufacturer of 3D printers and production systems for prototyping and manufacturing applications. The company is set to complete the merger with Objet in Q3. Previously a preview was completed of the earnings report for Stratasys. The research suggested that the company had a history of predictable earnings reports and that investors should expect a beat on earnings on August 1st. After reporting earnings on Wednesday night, Yelp (YELP) soared nearly 20% over the next two trading days. Why did this social media play jump while so many others have been falling to lows? The company connects people with great local businesses via more than 30M local reviews and approximately 78M unique visitors during Q2 2012. The main reason for the surge is that Yelp reported stronger revenue numbers that led to a solid EBITDA beat. The company also successively talked about the potential of mobile monetization though the actual results were immaterial. In reality, the company appears to have the same issues as Facebook (FB) so far. Quick, how many people expected the stock market to surge towards multi year highs at the start of August? The very time period where the market nearly fell off the cliff last summer. Even as the European issues continue to mount, it finally appears that the market has gotten past the never ending financial crisis. Not to mention that earnings report after earnings report provided solid numbers. Is the market finally able to focus on company specific events or will it be right back to the nuances in Europe as the Olympics end? In fact, maybe the Olympics have only hidden the issues as the world focuses on sporting events instead of financial issues. Don't be surprised to see next week bring out some fear mongering stories. For now, if your in the stock market just sit back and enjoy the gains while the average person is sitting on the sidelines watching stocks soar. Disclsoure: No positions mentioned. Please review the disclaimer page for more details. After reporting earnings on Thursday night, SandRidge Energy (SD) dropped 3% even as the market soared on Friday thanks to the bullish jobs report. For some reason the market was disappointed with a forecasted increase in capital spending while oil approaches $91. The company is an oil and natural gas exploration and production company focused on the Mississippian, Permian Basin, and now Gulf of Mexico. The market is very focused on reduced spending in the domestic natural gas sector that any added spending is seen as negative. Though natural gas still struggles around $3, the market is missing that oil remains strong. Why wouldn't an oil exploration company attempt to produce more oil at these prices? Prior to the market open on Wednesday, Phillips 66 (PSX) reported earnings that smashed estimates. The earnings this quarter were more interesting than normal, as this was the first independent report for the company since splitting from ConocoPhillips (COP). Following completion of this transaction, ConocoPhillips is now a leading refining and marketing (R&M), midstream, and chemicals company. Phillips 66's R&M operations include 15 refineries with a net crude oil capacity of 2.2 million barrels per day, 10,000 branded marketing outlets, and 15,000 miles of pipeline systems. With investors hungry for yield, should they jump into the very high 9.0% yield on Frontier Communications (FTR)? The answer might surprise you, considering the past of this long-suffering sector. Having been an analyst in the telecommunications industry for 15 years, industry names such as Frontier, that focused on the wireline business, don't conjure up much excitement. Most wrote off those companies for the trash heap years ago. A surprising thing happened on the way to total annihilation: the companies have been able to maintain a considerable amount of the wireline base while also dramatically reducing costs.